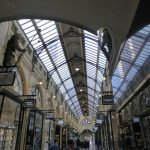 I’ve always loved arcades, ever since I was a small child and a visit to the arcade in Hull’s Old Town was a special treat…especially as it had the jokes and toy shop for me to spend hours in browsing the shelves for inspiration. The Royal Arcade is a bit more upmarket, and has historically been more like London’s posh arcades near the west end, but even today, there are quirky shops in this Melbourne beauty, like The Spellbox, which seems to be all based around spiritualists and palm readers and the like; or the Dungeon of Magic, downstairs under the main walkway, though I didn’t go down there to check it out. 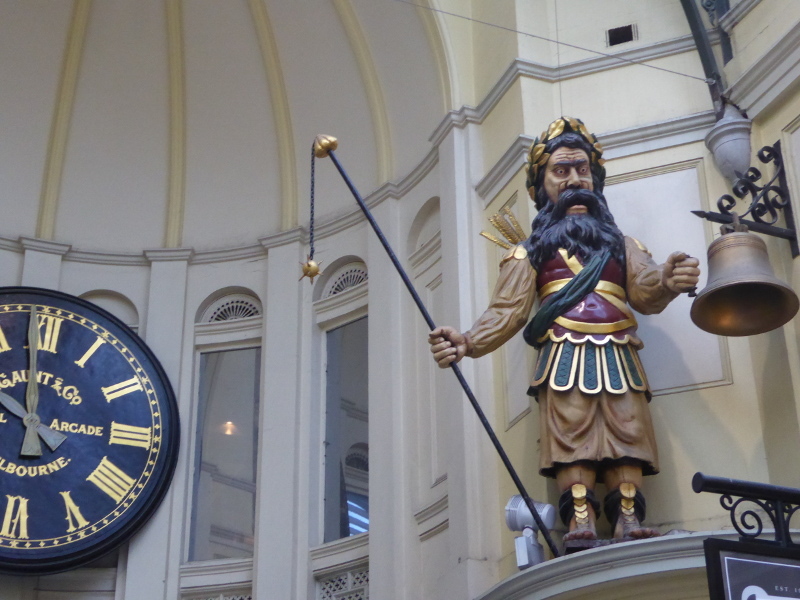 The biggest draw for the Royal Arcade must surely be the big sculptures of Gog & Magog. Now if you look at who these characters are, they’re an ominous addition to Melbourne’s shopping landscape: ‘companions of Satan’, representations of hostile nations, harbingers of the end of the world. 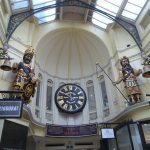 Makes me wonder why on earth they were brought into the Royal Arcade to mark the hours? I guess that’s one more shopping trip fitted in before Armageddon…? I didn’t manage to make my visit coincide with the chimes on the hour, but apparently these two creatures mark the hour every hour and have done since their installation in 1892. Don’t miss the long-bearded guy at the other end of the arcade, though. 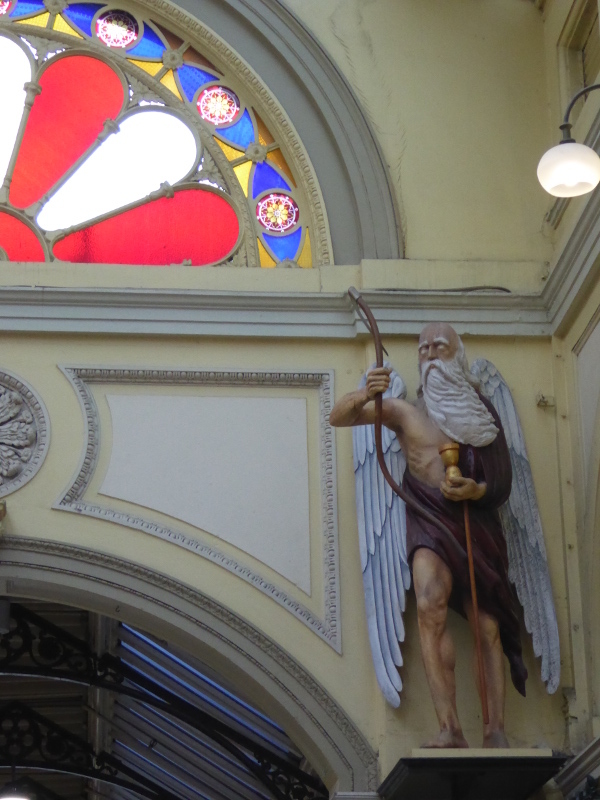 He’s on his own, and swings a scythe like the Grim Reaper, apparently a depiction of Father Time. Again, maybe another reminder to shoppers that they need to get on with something useful on this world before their own time’s up? 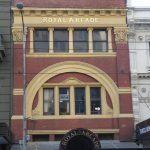 The brick façade that opens out onto Bourke Street is dated 1901 so came a few decades after the arcade opened. 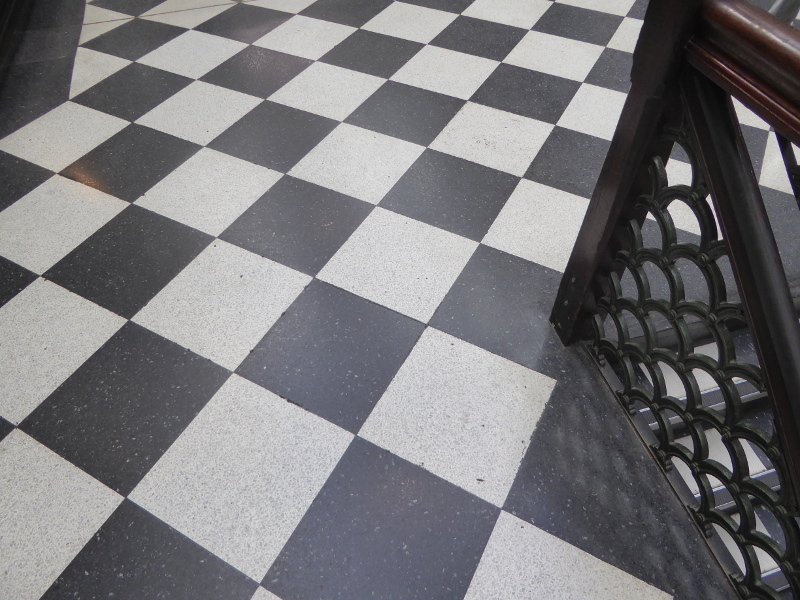 I’m not sure when the black and white tiling underfoot came in, but that also adds to its vintage feel and made it a must for my Vintage Victoria site. It’s such a shame the old Turkish Baths are now long gone, and most of the shops are not really for me if I’m honest, but I will keep coming back just for the excellent coffee and the reminders of time here in the heart of Melbourne. Oh, and speaking of Melbourne, I did actually quite like The Melbourne Shop if you are needing Melbourne-themed gifts for friends who need reminders of the place. There are shops to suit all sorts of tastes in the Royal Arcade today. The arcade website has a directory, though it is not necessarily kept totally up-to-date (still speaks of Padre Coffee, for example). For toilets before my coffee, I was sent over the road at Elizabeth Street to the Galleria mall (up the escalators). 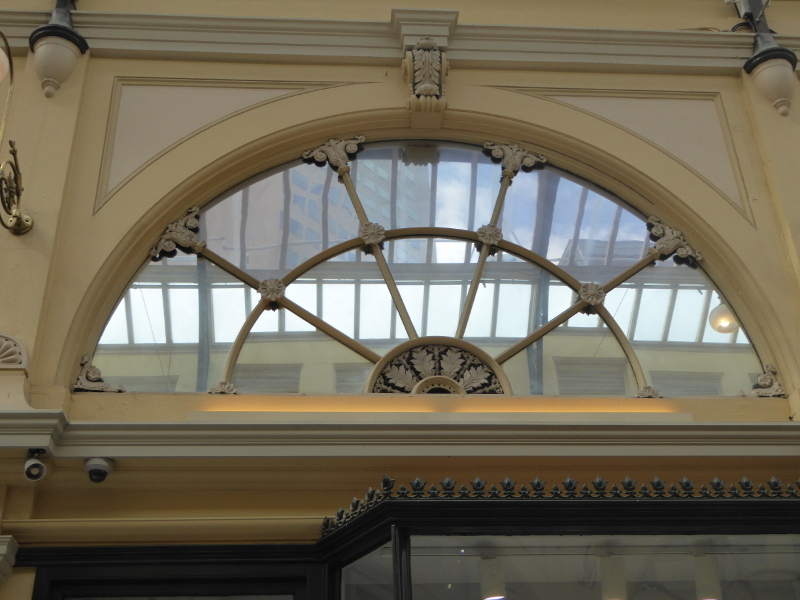 I had great fun looking back through the Trove website for articles on the Royal Arcade. 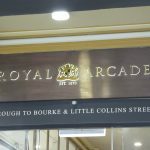 The Royal Arcade is the oldest surviving arcade in Australia, but it must have been such a grand place even in the late 19th century. 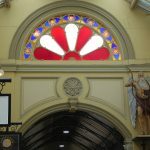 I loved this clip from The Leader in Melbourne in 1894 on the mirrors in the arcade: “The numerous mirrors in the Arcade prove a considerable attraction, and it is amusing to see the gilded youth of both sexes taking a sly glance at themselves as they pass to see if their attire is comme il faut ; but by no means would I insinuate that it is only the young folks who patronise the mirrors, for those who have passed their first youth are quite as weak with regard to their appearance as their juniors, if not more so”. 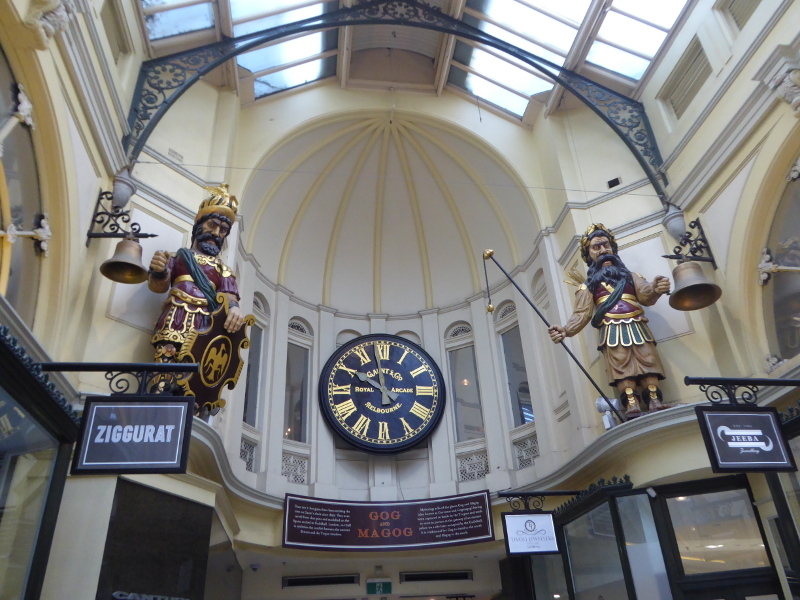 The mirrors are long gone now, sadly, though Gog and Magog still chime the hours, as they have done since 1892. 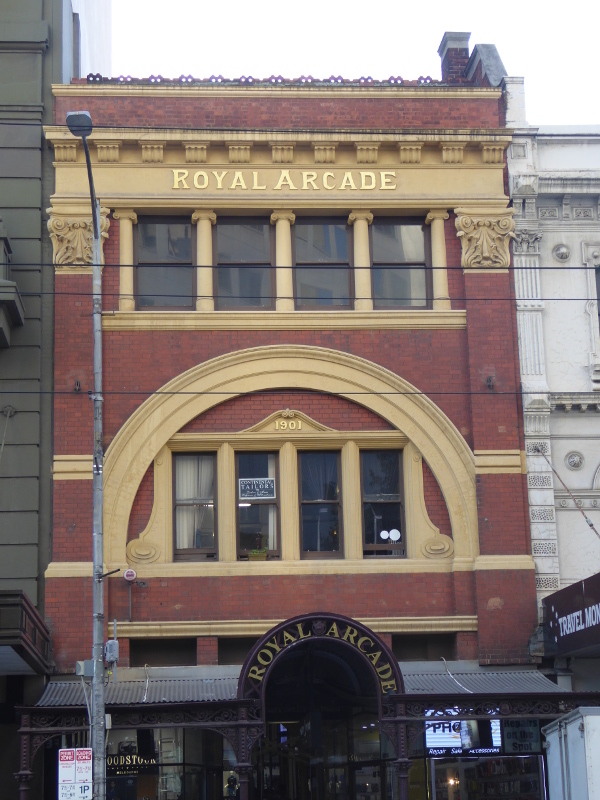 I loved the feature in The Age from 1950 which looked back on successive caretakers of the arcade. In 1922, it recalled: “When Mr. Wilson took over, the arcade was a decorative place, with a row of seats running down the centre, and a bronze statue at each end with a gas light on top. Between the seats were palms and tree fern”. So can anybody else remember the atmosphere in the arcade after the 1920s? I’m guessing its renovation in 2002 made it into the glossy, upmarket shopping destination it is today. But what of the feel of the place between the 1920s and 1990s? I’d love to know more about the caretakers of the Royal Arcade over the years. The Age introduced us to Mr Wilson in the 1920s, and there was another character called Mr Morton, who died in 1946, apparently: “Mr. W. Morton was familiarly known as “Old Bill,” who died about four years ago, was an imposing figure, standing over six feet and weighing about 16 stone. In his long coat and silk “top-per,” he used to stroll about, seeing that everything was in order.” Who came after ‘Old Bill’, and when did the top hat wearing caretakers stop being a thing? 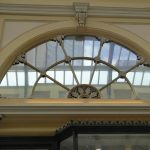 Of course, there is also talk in one of the links below of the ghost of the Royal Arcade: Whether or not you believe ghosts exist, many people claim to have spotted a ghost like figure living in the royal arcade. The woman with the spinning wheel resides in an empty second floor storage space above the main walkway. Sources say that they believe she has been drifting through the building for many years as she has often appeared with a spinning wheel.” (See the City Journal link below). Has anyone seen this woman?? 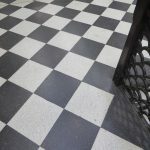 I like this historical blog, which approaches these vintage places in a similar way to me, looking for the stories linked to them. 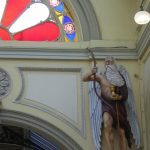 The focus of this Melbourne blogger is Gog & Magog so for more detail on those two characters read this piece from 2016. 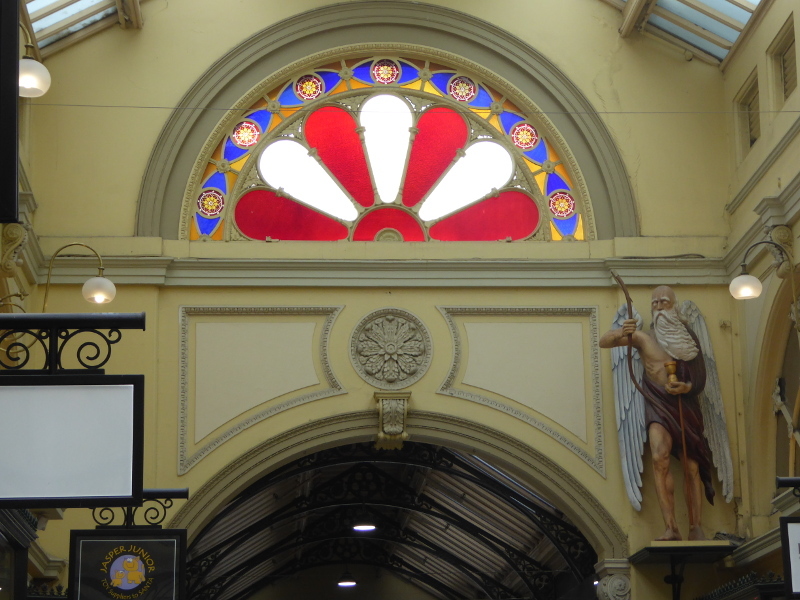 Some brief historical notes about the Royal Arcade on this Melbourne Facts blog site. 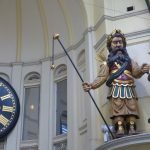 I liked this blog post about a quirky shop in the Royal Arcade, though I fear the shop may have closed its doors since the blog was written in 2017. 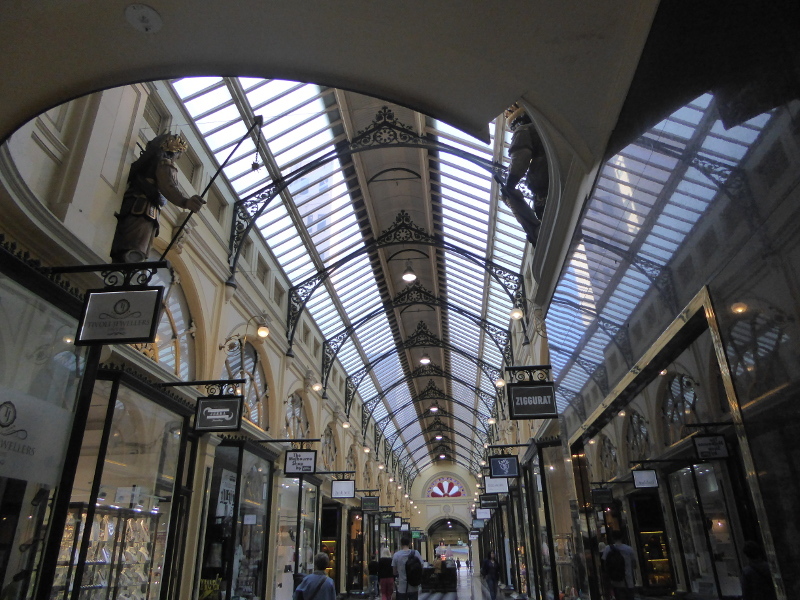 What are your stories and memories of the Royal Arcade? Have you seen the ghost? Do you remember the top-hatted caretakers? What’s your favourite shop in the arcade? Or was there a shop you used to love which is no longer there? 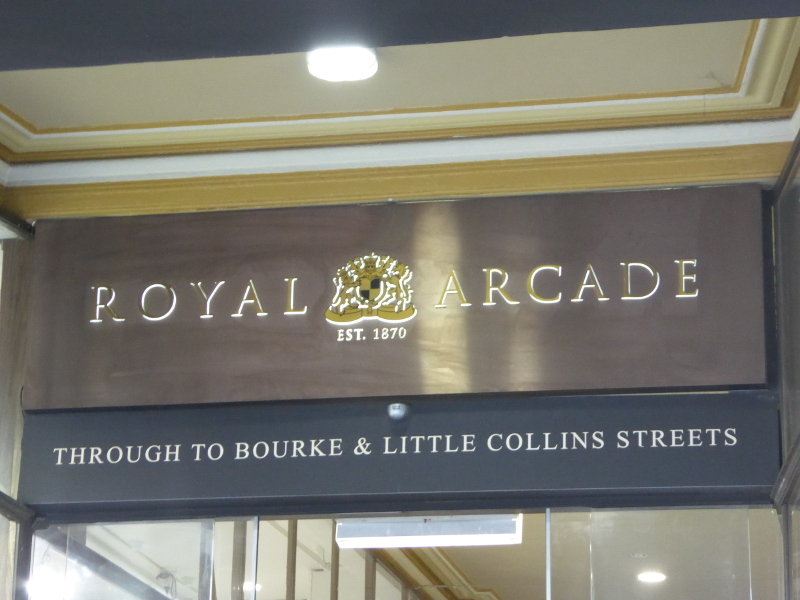 And can you help me with some stories on what was the Royal Arcade like between the 1920s and the 1990s, when it got its facelift? Comment below if you have anything to add. 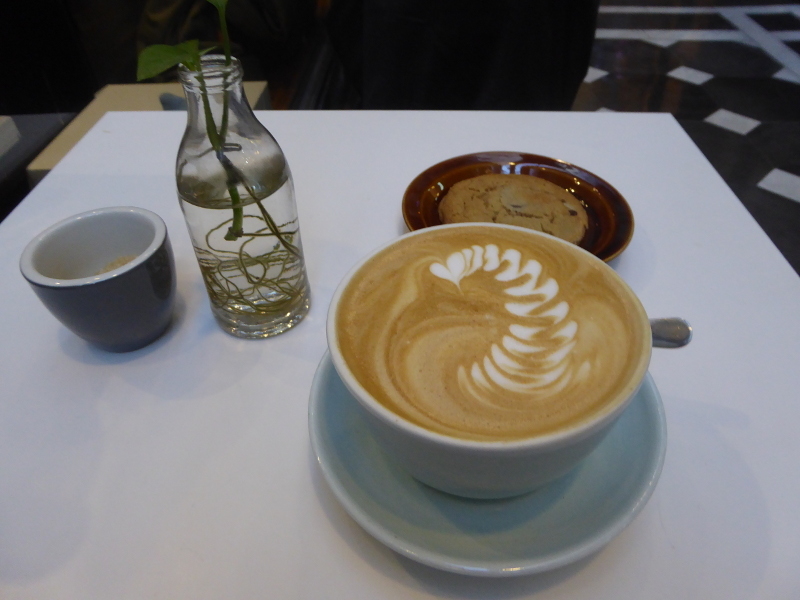 One of the highlights of any visit to the Royal Arcade has to be the quality coffee at Kit Espresso. Formerly owned by the excellent Padre coffee roasters, the guys who run Kit still serve Padre coffees, and with its cute space and spiral staircase, this coffee shop in the arcade is a great spot to rest any weary legs and recharge the batteries. I note you referred to one of my blog post – thank you.